IAG has completed the take over of Bmi. The main BMI airline is to be integrated with BA, but IAG reiterated that it did not intend to keep the BMI Baby and BMI Regional businesses. 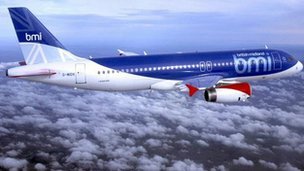 IAG is receiving a “significant price reduction” on the agreed £172.5m purchase price for taking the BMI Baby and BMI regional airlines on. BMI is estimated to be losing about £3m a week. The deal was cleared by the European Commission last month on certain conditions, including that 14 slots at Heathrow airport were released. A Scottish consortium called Granite may buy the regional part of Bmi, for flights to and from Scotland, and perhaps saving some 400 jobs. The owner of British Airways and Iberia, IAG, has completed its takeover of BMI from Lufthansa. The main BMI airline is to be integrated with BA, but IAG reiterated that it did not intend to keep the BMI Baby and BMI Regional businesses. IAG is receiving a “significant price reduction” on the agreed £172.5m purchase price for taking the BMI Baby and BMI regional airlines on. BMI is estimated to be losing about £3m a week. IAG’s takeover of BMI was fiercely opposed by rival Virgin Atlantic, who argued that it would distort competition as IAG would have too many landing slots at London’s Heathrow airport. However, the deal was cleared by the European Commission last month on certain conditions, including that 14 slots at Heathrow airport were released. BMI’s main airline – which serves Europe, the Middle East and Africa – is to be integrated with British Airways. Last week, BA said the merger could lead to the loss of 1,200 jobs, and that it had begun consultations with unions. When IAG struck the original deal with Lufthansa, the German airline had the option to sell both BMI Baby and BMI Regional before the deal was completed. However, as it did not, IAG got a discount on the takeover. “BMI Baby and BMI Regional are not part of IAG’s long-term plans and will not be integrated into British Airways. IAG will pursue options to exit these businesses and more details will be provided in due course,” IAG said in a statement. About 330 people are employed at BMI Regional and some 470 at BMI Baby. The new owner of BMI doubts it will be able to sell its loss-making BMI Baby and Regional units, putting jobs in those units under threat. IAG, the company that owns British Airways and Iberia, always said it was not interested in owning the two units. It received a “significant price reduction” for its BMI purchase for agreeing to take the low-cost and regional businesses as well. IAG boss Willie Walsh has now said he is “not confident” about selling them. “These are airlines that Lufthansa struggled to sell but we are going to make an effort to sell them,” he added. About 330 people are employed at BMI Regional and 470 at BMI Baby. IAG has previously said that if it cannot sell the two units it will shut them down, but now says that it is reviewing all of its options and that talk of job losses would be premature. British Airways has said the merger will lead to the loss of up to 1,200 jobs, and that it has begun consultations with unions, but that does not include jobs at BMI Baby or Regional. It bought BMI for its main airline, which owns valuable slots at Heathrow Airport. HOPES have been raised that the Aberdeen-based regional arm of airline BMI may be sold to a consortium of local businessmen, securing nearly 400 jobs, after its new owner said it was not part of the company’s long-term plans. International Airlines Group, the parent company of British Airways, yesterday finalised its £172.5 million purchase of BMI from Lufthansa and confirmed plans to integrate the heavily loss-making airline into BA’s operations. Lufthansa had tried to dispose of both bmibaby and BMI Regional prior to the sale but failed to secure a buyer, prompting union concerns yesterday for the future of around 800 staff at both airlines. However, a group of investors known as Granite is understood to be close to finalising a deal to buy BMI Regional, which flies from Glasgow, Aberdeen and Edinburgh to a number of UK and European airports. The consortium nearly reached a deal late last year which fell through after one of the backers pulled out, a source said. “They’re about 95% there. There have been hopes raised in the past but there is a new investor in place,” the source added. The consortium is being led by Ian Woodley and Graeme Ross, who founded Business Air before it was sold to British Midland in 1996 and changed its name to BMI Regional. Another key player is Robert Sturman, who was chief executive of British World Airlines for a decade. Last week, IAG warned that the takeover of BMI was likely to lead to up to 1200 job losses. Posted: Saturday, April 21st, 2012. Filed in General News, Recent News.